Modern societies and economies depend more and more on the Internet whose foundations are based on mechanisms and algorithms that were developed in the 70s and 80s. New business and home applications require new features for which the Internet was never designed and are faced with security problems that reveal the architectural deficits of today’s Internet. The project G-Lab, the national platform develops technologies for a reliable and secure network of the future. New Internet services and applications make increasing demands on security, reliability, and quality of the networks. It is more than just music and video downloads: services in medicine and healthcare. Business processes or advanced training over video conferences are examples for fields of applications for which the Internet becomes indispensable. To cope with the growing demands, new architectures and protocols need to be developed on the conceptual level and tested in an experimental facility. The project partners develop a secure and reliable platform for applications and services. Most important is the development of new mechanisms for routing, addressing, etc., and their investigation with regard to practical feasibility, scalability, and performance in realistic environments. To take a premier position in this evolution, leading European companies and German universities joined forces. G-Lab is part of the worldwide efforts to develop the foundations of a future Internet. The Internet is an integral part of an efficient society: virtual social meeting points, business processes in economies, education and advanced training, telemedicine and entertainment base upon the Internet. Similar to the road system and the power grid, the modern network infrastructure is the base of our wealth and essential to human basic needs for communication. The technical objective of the cooperative project „G-Lab“ is the development of network architectures and communication protocols that are more adaptive to new Internet applications and services. An essential component is the creation of a comprehensive security concept for the future Internet. 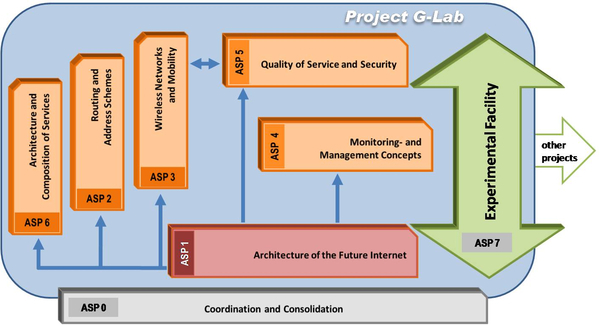 Project title: G-Lab: "National Platform for Future Internet Studies"